I’d be lying if I said I am a self-tan pro, the truth is…I could never seem to get it to look flawless and well-blended. Because of that, I’ve been searching high and low for a self-tanner that is idiot-proof. We all know self-tanning can be intimidating – one false move can take you to Oompa Loompa status, fast. I’m always on the hunt for a fake tan product that 1. doesn’t have that infamous scent, and 2. is quick & easy to use. I’m not too phased about it being extremely long lasting because that can sometimes mean it fades in patches. If you’ve been following my blog for a while, then you will know I don’t do the whole ‘basking in the sun’ thing. I don’t swim and I don’t sunbathe, and yet I still like to think I’m a mermaid for some reason…total weirdo, I know. My complexion is quite…how shall I put it? …melanin-challenged…and every now and again I like to give my skin a bronze glow using a sunless tanner. Glowing skin has become really popular all over the world, but tanning in the sun isn’t the healthiest for your skin AND who wants to bake in the sun on a cold Winter’s day? 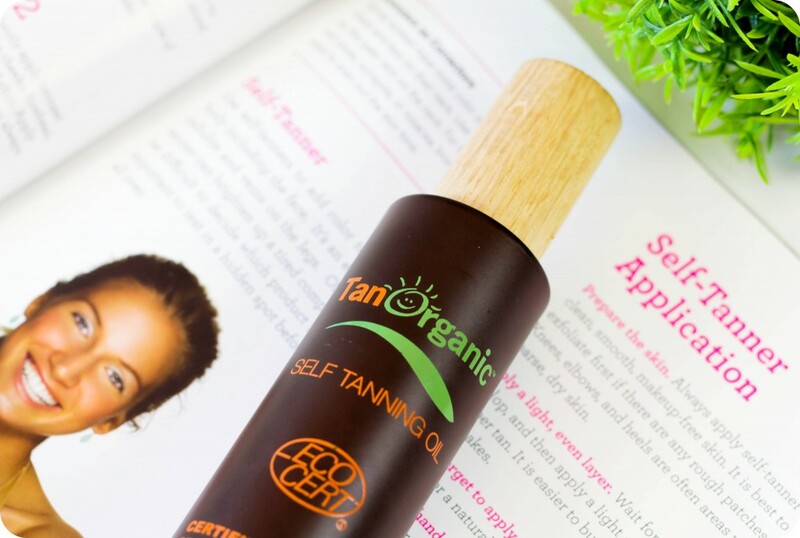 TanOrganic self tanning oil products allow you to maintain a fabulous glow all year round, while staying out of the sun and keeping your skin hydrated. Searching for an organic product that will give you a natural-looking tan – no sun or skin damage required? Look no further, I got you covered (no pun intended!). At the end of this blog post, I also give you a few tips & tricks to help take the difficulty out of your DIY tan. ♥ First and foremost, this self-tanner smells amazing! There is absolutely no unpleasant fake tan scent, it smells zesty and citrusy – very refreshing indeed. ♥ This self tanning oil contains NO parabens, NO toxic preservatives and NO artificial drying agents. When we hear ‘organic’, we usually think the product will likely fall short of its synthetic counterpart. But remember, heavily fragranced and chemical laden products can cause bad skin reactions. And in all honesty, TanOrganic didn’t disappoint. ♥ The tanning oil contains a unique blend of 8 different plant oils including Borage seed oil, Argan oil and Orange peel oil – this means it nourishes the skin while adding a bronzed glow. ♥ Ingredients are 99,6% natural and it is the world’s first and only Eco-certified self-tan brand. ♥ All TanOrganic products are environmentally friendly & PETA approved. ♥ The packaging is made of glass as this is the most protective way to store naturally active ingredients. The dark colouring of the glass also protects the ingredients from harmful UV light. ♥ The TanOrganic Self Tanning Oil is lighter than their original self-tan but darker than a gradual tanner. I love that this self tanning oil gives my skin a natural-looking, sun kissed glow – it’s definitely not a product that is going to take you from pale to Jersey Shore in 30 seconds flat. I’m not someone who likes to spend ages rubbing, buffing and blending (heck, I have enough difficulty motivating myself to apply a body lotion every night) and found this is product is just what I needed because it blends so well and absorbs quickly too. I haven’t experienced any patches or streaks, plus it doesn’t leave an oily residue behind. My skin feels soft and nourished, just the way I like it. Application couldn’t be easier – simply pour a teaspoon amount of this oil into the palm of your hand (no need to use a tanning mitt or glove), rub your hands together and blend in circular motions into clean skin (no need to apply a lotion / moisturiser to dry areas beforehand). I find a teaspoon amount is enough for 1 arm & shoulder application. After leaving the tan on overnight it developed in to a lovely golden brown shade. It didn’t stain my PJs or sheets, which is a huge bonus for me. I even applied a another layer on the second day and was pleased to see it still looked natural, just a tad bit darker. Because this self-tanner is oil-based and so moisturising, it fades evenly (I found it lasted on my skin for about 4 days). The ultra-lightweight formula is gentle enough for the face but I haven’t tested it on my face as yet as my skin has been behaving for the last 3+ weeks and I don’t want to jinx it. Ok, so truth be told…I got a little bit ahead of myself and forgot to take a ‘before’ photo. But the above photo was taken a few days before I started testing this self tanning oil, so it’s quite accurate in terms of my ‘before-skin-tone’. As you can see in the photo above (this is just 1 layer of the TanOrganic Self Tanning Oil), it gives a natural glow to the skin without looking like you were super heavy-handed with the faux tan. The only improvement I would suggest to make this product even better, is to add a colour guide to the oil (a cosmetic bronzing tone) so that I can see where I’ve applied the product and where it needs a little bit more blending. It does, however, leave a wet sheen (which disappears as soon as the product has been absorbed) on the skin so you can see where you have applied it. The TanOrganic Original (it provides a darker tan) does have a colour guide apparently, so if you are set on something that will show you exactly where you’ve applied the product, then rather opt for the TanOrganic Original (which is currently on sale here). TanOrganic Self Tanning Oil retails for R 599,00 and is available in their online store here or in the Beauty Worx online store. I’ve used my bottle for 2 full body applications so far and it feels like my bottle is still 80% full (I can’t be sure, though, as the bottle is completely opaque). Below are tips for application of any type of self-tanning product – lotion, mousse, aerosol or oil. ♥ By now, almost everyone is aware of the pre-tan mantra: Exfoliate, exfoliate, exfoliate! You don’t want to skip this step as it helps a sunless tanner go on smoothly and keeps it from clinging to dead skin cells (causing dark patches). ♥ If you need to get a wax or a manicure, shave your legs or touch up your hair colour, do it before applying any self-tanner as those treatments can remove self-tan. ♥ Always start at your ankles and work your way up to your shoulders & arms to prevent any weird marks being created when you bend over. ♥ If you do decide to apply a self-tan product to the face, use a cotton bud to wipe eyebrows post application to prevent bronzed brows. ♥ It’s always best to build colour incrementally, so rather apply a thin layer on the first day and intensify with a second layer on the second day. You don’t want to apply a thick, uneven layer of sunless tanner in one go – trust me…been there, done that. It looks awful. ♥ After showering, towel dry your skin and wait 10 minutes until you are 100% dry before applying your self-tan product (especially the TanOrganic self tanning oils). Remember: Oil & water don’t mix. ♥ Use a water-based moisturiser to ensure the skin is free to absorb all the tanning product. If you use an oil-based lotion or body butter before self-tanning, the oil can sit on the skin, creating a barrier that will cause it to streak. A quick way to tell if your moisturiser is water- or oil-based it to look at the first ingredient listed on the label. Chances are it’s Aqua (water) or maybe even Aloe Vera, but steer clear if the first ingredient is an oil of any kind. TanOrganic has been developed to absorb into the skin even though it’s an oil, so disregard this tip if you are using a self tanning oil. ♥ Wash your hands immediately after you finish, you don’t want to be stuck with orange palms. ♥ Self-tanner mistakes happen – if you were a bit heavy-handed with the fake tanning product, do the following: Mix together fresh lemon juice with a few tablespoons of baking soda (a natural exfoliant) until the mixture becomes a paste. Then shower and use your DIY exfoliator to brighten up any streaky / dark sections. Lemon is naturally acidic and acts a gentle version of bleach to lighten unwanted colour. ♥ If you don’t have baking soda, rub half a lemon on the area for a minute or 2 before lightly buffing it with a damp towel. ♥ Prolong your tan by using a gentle body wash (no exfoliating body scrubs) and make sure your skin is always moisturised. If you have also applied a self-tanning product to your face, avoid using retinols and acne treatments, as these can dissolve the colour. ♥ When you’re ready to refresh your tan, exfoliate and begin the cycle again – never apply your self-tan over a fading tan. Adding more colour on top will only enhance the patchy, zebra look. The TanOrganic Self Tanning Oil fades evenly though, and I found I didn’t need to exfoliate after a couple of days to remove the tan completely. My tan had already completely faded after the 5th day. Another reason why I love self-tanning? I don’t have to worry about tan lines, plus self-tanners also happen to mask everything from acne, to cellulite, to uneven skin tone. I’ve noticed my legs look a lot more toned when they’re tanned – and just the other day Neal commented on how healthy my skin looks with a bit of a bronze glow. Gone are the days when your skin might still be stuck in hibernation mode due to the Winter cold. You can instantly add a gorgeous glow from head to toe with the TanOrganic Self Tanning Oil. If you are a self-tan newbie and a bit intimidated by full-on self-tanning products, then definitely invest in this one – it’s super quick and easy to apply. It’s also the perfect product for those who care about what they put on their skin but still want a professional looking self-tan that provides nourishment and hydration too. P.S. Yep, TanOrganic did send me this bottle to test out…but you know me, I like to keep it open & honest here on the blog. I only recommend products that really work for me. Next Post Giveaway Prize – Too Faced Chocolate Bar OR Boudoir Eyes Palette? I don’t need a tan…I’m coloured….so I never bother to look at tanning products. BUT because this is your blog, I at least wanted to read your review. I must say it looks so natural on you! If you are wanting a tan….this seems to be worth the money to get that tan. I had to LOL at you using a ‘fake’ before picture…he he. You’re the best, Simone! 😀 Thanks so much for your support! This tan suits you so well! I really love this product and the best part is that it truly doesn’t have that nasty self- tan smell! This product looks amazing on you – I am so pleased you had such a great experience. Its definitely one of my best! The TanOrganic self tanning oil looks great on your skin! Your tips are always so helpful, thanks a lot!